They are the largest animals to ever exist on planet Earth, weighing over 300,000-pounds. That’s not a typo. Three hundred thousand pounds! To put it in perspective, that’s how heavy the regret is of the person who first set up Donald Trump’s Twitter account. As big as these aquatic behemoths are they feed on surprisingly tiny creatures: Krill. These itty bitty, plentiful crustaceans are found in every nook and cranny of the ocean. They’re like nature’s craft glitter. Blue whales need to be smart when feeding on krill, a behavior recently observed by drone south of New Zealand. Here is the video—which is actually quite fascinating, and completely alien looking. 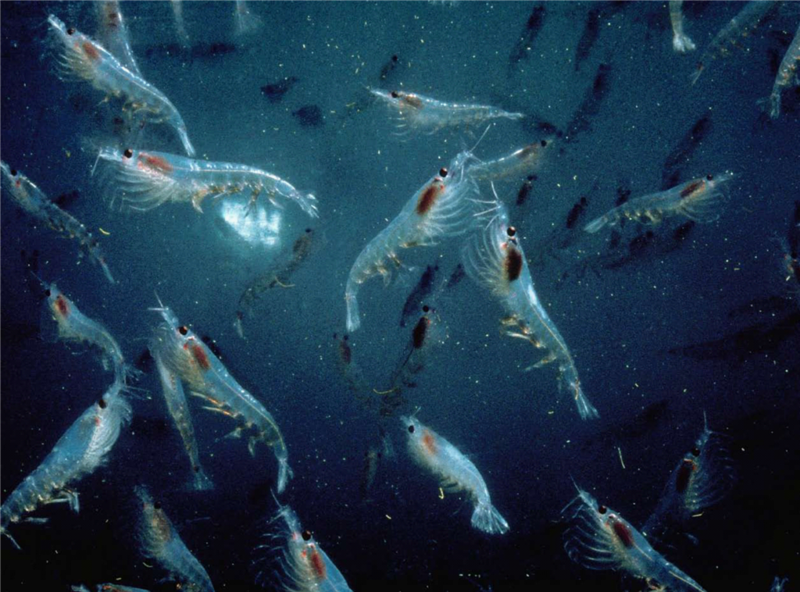 Krill gather to form giant pink clouds in the ocean, but not all are created equal. A blue whale picks and chooses which clouds to eat, as opening its mouth acts as a giant brake bringing the animal to almost a dead stop. Can you imagine the energy required to get a 300,000-pound creature moving again? We are throwing money at engineers trying to figure out the best way to get a 4,000-pound car rolling forward on wheels. The patch of krill has to be large and dense enough to be worth eating. If a blue whale tries to snack on every small group it encounters, the energy gained would pale in comparison to the energy exerted by the 150-ton animal. I’m tired after a few laps of freestyling around the pool, and I only weigh .06% of those beasts (And by “freestyling” I mean the stroke, not the rap. I save my freestyle rap for the golf course only). For the blue whale, it’s all about being smart with energy. Gains and losses. Input and Output. P & L statements. Cost-benefit analysis. I get that. As a parent, I do basically the same thing. Kids are exhausting. As finite human beings, we only have so much in the tank. A tank that usually dries up just before the threshold of bedtime. Not after, or during. We hit exhaustion right before we have to get our kids into their beds. Hence the screaming and tear-stained sleeves of two depleted adults that just want their children to brush their teeth for God’s sake because science has told us it’s important or whatever. So when an opportunity arises to conserve energy, I’m going to take it. It’s not laziness. It’s cost-benefit analysis. It’s survival. A few months ago we were all at my parent’s house for dinner. My mom cooked, which meant everything was right with the world. 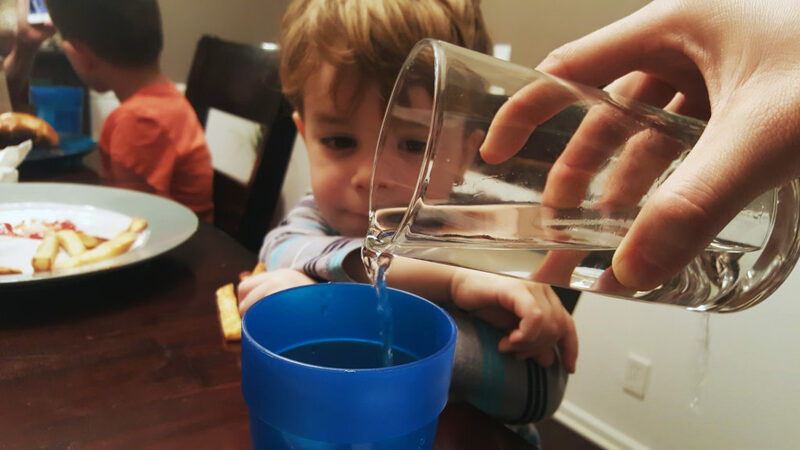 I sat next to my two-year-old-at-the-time Remy, in culinary bliss, when toward the end of the meal he turned to me and said, “Daddy, I want mo’ dink.” Then he waved his empty water cup in my face with a sly grin and bouncing eyebrows, like he had saved my life once and continues to remind me how unbalanced the scales are. I did not want to get him a refill. I wanted to finish the last few bites of my delicious dinner while it still hovered above lukewarm. I wanted to continue the conversation we adults were having. But above all, I knew the night was far from over. After dinner we would still need to sock-shoe-and-coat our four children, corral them into our van, drive across town while trying to keep our little boys awake, herd them into the house past their bedtime, keep them all from emotionally falling apart in the kitchen because “we are too tired to climb the stairs,” get teeth brushed because science, get jammies on, songs sung, and hugs and kisses dispersed. Then collapse like the aforementioned marathon runner. I looked at my two-year-old son as I calculated the energy required to walk to my parent’s kitchen and fill his cup, versus how much energy I still needed to survive the night. I then concluded that this patch of krill wasn’t worth the effort. So in one swift flick of the wrist, I scooped up my half-full glass and pulled a Blue Whale move. Even though I was still thirsty, I generously dumped my water into his cup. Not because I wanted to teach him sharing, or instill in him a sense of family, but simply because I did not want to get out of my chair. There’s your refill buddy. This may look like laziness. To the trained eye though, it was purely cost-benefit analysis. I had to keep my energy tank as full as possible for the looming next few hours, and took the most efficient route to meet the need of my child. I do this with pretty much anything. Kid: Dad, can I have some more Bagel Bites? Kid: Dad, I can’t find my shoes. Me: Just get in the van, I’ll give you mine. Kid: Dad, I dropped my toothbrush in the toilet. Can you go get me a new one? The Blue Whale concept isn’t new. I know I’m not alone in this. As caretakers of needy children, we have to be smart. They say to pick and choose your battles. We also need to pick and choose what is going to get us out of our chairs. Because like the earth’s most massive, and smartest animal, we can’t just be going around burning energy willy-nilly. We’re carrying 300,000-pounds of parenting responsibility. We have to cut corners somewhere. So if you often load your plate with extra food in anticipation of “Mommy, I want some more,” there is no shame in it. Scoop the extra macaroni and cheese onto their dish and continue sitting in your seat because, well, you are brilliant. You are a survivor. You will be the one that makes it to the end of bedtime with enough energy to fall asleep in front of Netflix. You are a winner. And I’m proud of you. I don’t know if the mighty blue whale is earth’s smartest animal, but when it comes to parenting, in my book, they are currently in the lead. Validation ahoy. This is awesome. Why did I never think of these things?? This is why we are so tired as grandparents. We used up so much unnecessary energy back in the day! Brilliant! This explains why I’m so exhausted being the “Best Aunt Ever”… Being at their beck and call is not good business. Ha!!! Pure awesome, Ryan. Thanks for investing into this cloud of krill to teach and let us laugh alongside you.